Generally, a balloon shade gathers into a series of puffy scallops when raised. 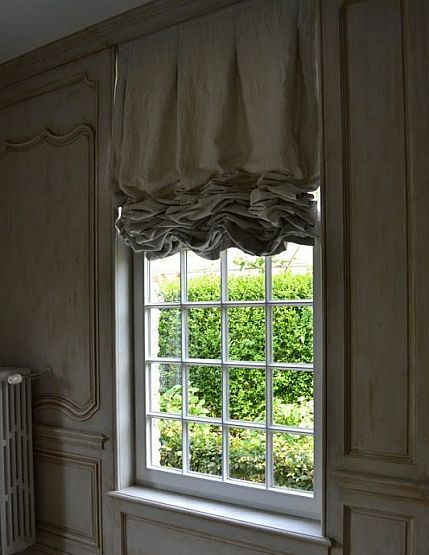 Gathered shades have dressed windows for centuries - forming a staple of interior design. The balloon shade delivers softness and texture, but it remains more of a decorative element than a practical one, as it requires fluffing and straightening. Consider using balloon shades in rooms that are traditional in style and require little change in light to keep maintenance to a minimum. With today’s trend towards sleek, tailored styles, balloon shades are less common. The pleated balloon shade is a bit more structured than some of the gathered or waterfall styles of balloon shades - fitting into contemporary trends. It uses inverted pleats along the top of the shade that fall into soft poufs at the bottom. The multi-pouf creates elegance that makes it a good choice for a formal setting and the soft folds enhance more intimate settings. 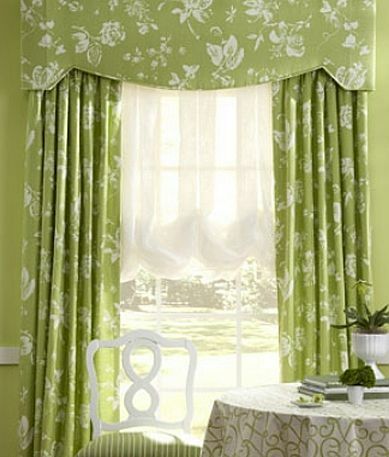 Softer fabrics work best with this style - light to medium weight fabrics such as cottons, linens, silks and sheers. Solid fabrics and light colors add sculpture without making the shade appear fussy. Deeper colors and fabrics with sheen appear more formal. Heavier fabrics will not want to fold easily and will require much dressing if raised and lowered frequently. Large scale, lightweight floral pattern Bastrop color cream. Light colors suitable for a more casual, intimate setting. Large scale floral with deep color. Pattern La Fonda Garden color autumn. Rich colors for a formal dining room or library. Lightweight, light colors with a subtle vertical emphasis. Pattern Nishino color lemongrass. Calming, for a bedroom or airy sitting room. Pleated balloon shade with ball fringe on the bottom edge. Mounted behind a cornice. Pleated balloon shade with wide poufs with beads mounted on the bottom edge. 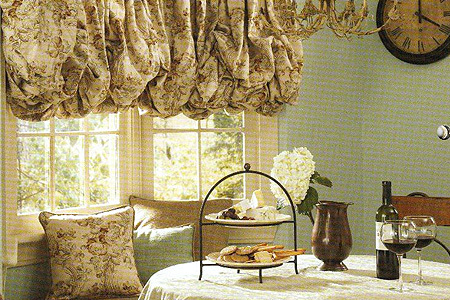 Sheer pleated balloon shade mated with drapery panels and a cornice. Sheer balloons are usually unlined. 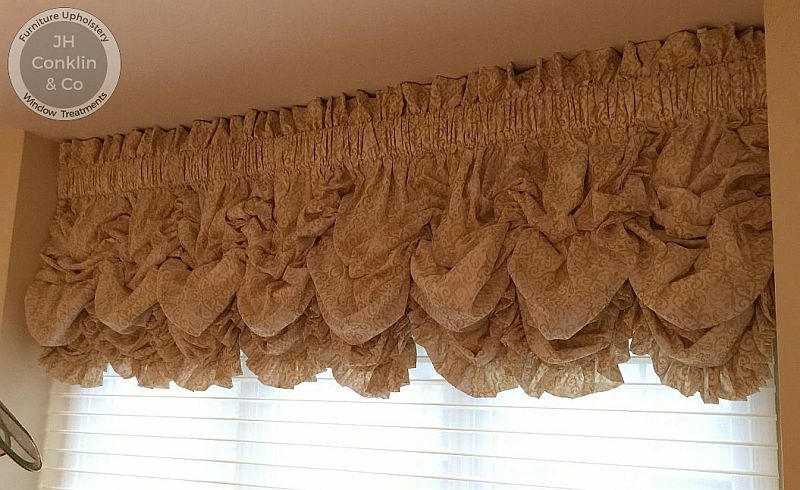 Here is a shirred style pleated balloon shade we did for a family in Voorhees, NJ. It features ruffles along the header board and along the bottom edge. It is used as a valance, so it will only cover half of the window when lowered. This saves fabric to construct it, and less fabric to gather into the raised position - lessening the bulge of the fabric.